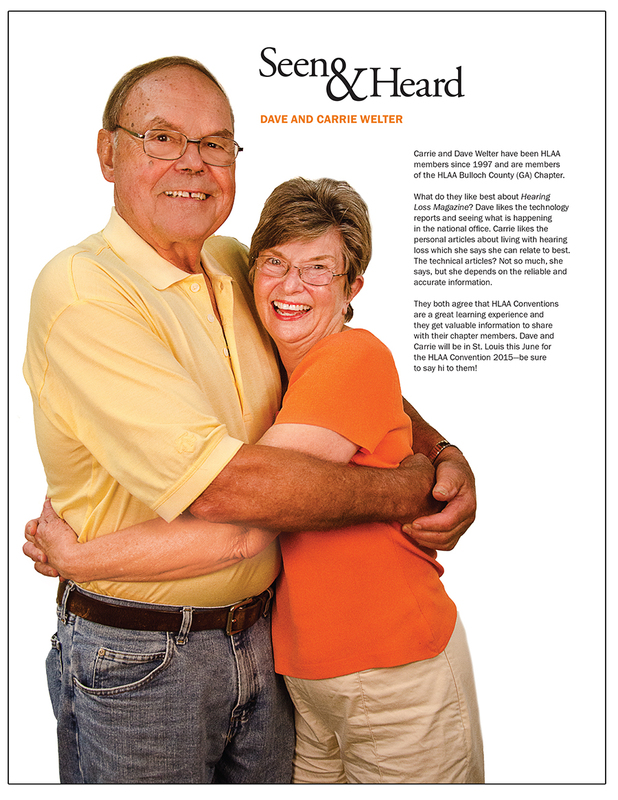 Dave and Carrie Welter are profiled in the Seen & Heard column of the May/June 2015 issue of Hearing Loss Magazine, published by the Hearing Loss Association of America. I photographed Dave and Carrie in Austin at Convention 2014. MY HEARING LOSS…I don’t have a significant hearing loss. I FOUND OUT ABOUT HLAA…from my wife, Carrie. SAGE ADVICE FOR SOMEONE NEWLY-DIAGNOSED WITH HEARING LOSS…Join a chapter of HLAA and learn all you can learn. DISADVANTAGES OF HEARING LOSS…it separates you from the real world. ADVANTAGES OF HEARING LOSS…You don’t have to sit through boring lectures. I LIKE BEING INVOLVED IN AN HLAA CHAPTER BECAUSE…I am able to help people with hearing loss communicate better. THE FIRST THING I BOUGHT WITH MY OWN MONEY WAS…a college education. THE HARDEST THING I’VE EVER DONE WAS…say good-bye to my 16-year-old brother when he died. HOBBIES…wood-turning, fishing, vehicle restoration, historical preservation, etc. MY LITTLE KNOWN TALENT IS…turning wood trash into treasures. I WISH I HAD A TALENT FOR…playing the piano. I HAVE A WEAKNESS FOR…good beer. I COLLECT…wood stumps, burls, walnut, cherry and any other beautiful wood. IF I HAD TO DO IT ALL OVER, I WOULD…become more focused on my family. YOU’VE WON A $1,000 SHOPPING SPREE TO A FAVORITE STORE…I would go to Highland Woodworking in Atlanta and buy woodworking tools. I HAVE A FEAR OF…not getting my chores done. MY LONG-TERM GOAL IS…to live to 114. MY HEARING LOSS…I inherited it from my father. When I was in the fourth grade a hearing test revealed a mild hearing loss, although I probably had it from birth. In my mid-thirties I got my first hearing aids and now have bilateral cochlear implants. I FOUND OUT ABOUT HLAA…I got a notice about a chapter meeting in nearby Aiken, South Carolina, with Pat Pennington as the organizer. I truly found my place. SAGE ADVICE FOR SOMEONE NEWLY-DIAGNOSED WITH HEARING LOSS…Acknowledge it, accept it, join HLAA and do all you can to communicate with others. ADVANTAGES OF HEARING LOSS…selective hearing—great excuse! I LIKE BEING INVOLVED IN AN HLAA CHAPTER BECAUSE…I can help people with hearing loss at the local level, one-on-one. MY FIRST MEMORY OF BEING REALLY EXCITED WAS…learning to swim at the river at age four. THE FIRST THING I BOUGHT WITH MY OWN MONEY WAS…a 1963 Comet. I LOVE THE SOUND OF…birds, which I can now hear with my cochlear implants. I MOST DEFINITELY AM NOT…an artist. MY MOTHER TAUGHT ME…about God. MY FATHER TAUGHT ME…to be honest. I HAVE A FEAR OF…the unknown. 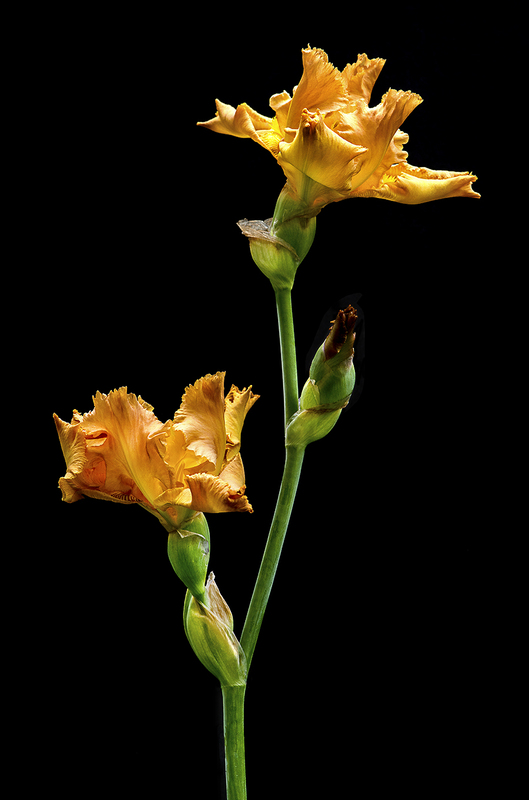 I REALLY SHOULD…stop and smell the roses. I SIMPLY CANNOT LIVE WITHOUT…my Dave. For Installment #6, we have Dan (Texas), whom I met through FB and who happens to be wearing a really cool shirt with giant koi on it (how’s that for a nod to ponds? ); my cousin Deanna (Georgia); my friend Hollace (Maryland); Joni (Couers Fleurs Farm in Kentucky)—I met Joni’s brother, Gary, when I was photographing one morning at Kenilworth and now I’m FB friends with him, Joni and her husband, Ed (all of whom have beautiful gardens that I want to photograph); Tammy (Georgia)—who is my cousin Deanna’s best friend AND, after some family history research last year, I have discovered that Tammy’s husband Darrell is actually my cousin, so that makes Tammy not just a friend but a cousin-in-law! (Is there such a thing? ); Tammy used the stamps today on mail for their family business, Merritt Heating & Cooling; and last, but certainly not least, Elizabeth (Texas), whom I met on FB. Thanks to all the participants who continue to submit to my “Traveling Water Lily Forever Stamps Project.” For Installment #5, we have my sister-in-law Ann (Kansas), friend-through-HLAA Juliette (Wisconsin), blog subscriber and new friend Heidi (California), my friend Martha‘s niece Erica (New York); former boss/mentor and friend Brian (Texas), Erica’s dad, Peter (New York) who is my friend Martha’s brother​, Martha’s mother Virginia (New York), friend-through-HLAA Marjie and her mother Judy (Florida), and a creative First Day Cover artwork submitted by Lloyd (North Carolina). Thanks for purchasing my water lily FOREVER stamps and sharing your mugs with me! I’ll be announcing details on a contest to win a signed 20×30 gallery wrap canvas, which will be awarded to the person who collects the most selfies (need name/city/state of each) by an end date. Details to follow! Come on, stamp lovers—-get me those entries! 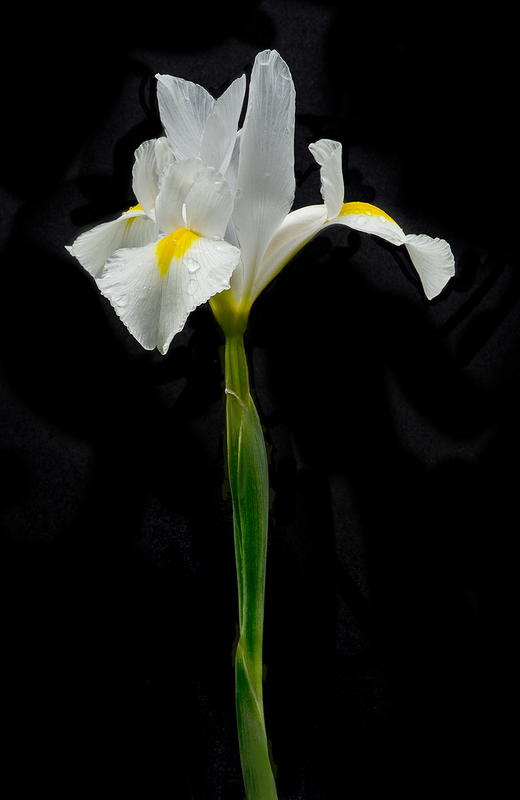 And one more from my garden…Bearded iris (Iris germanica sp.) I have no idea which cultivar/hybrid this is. 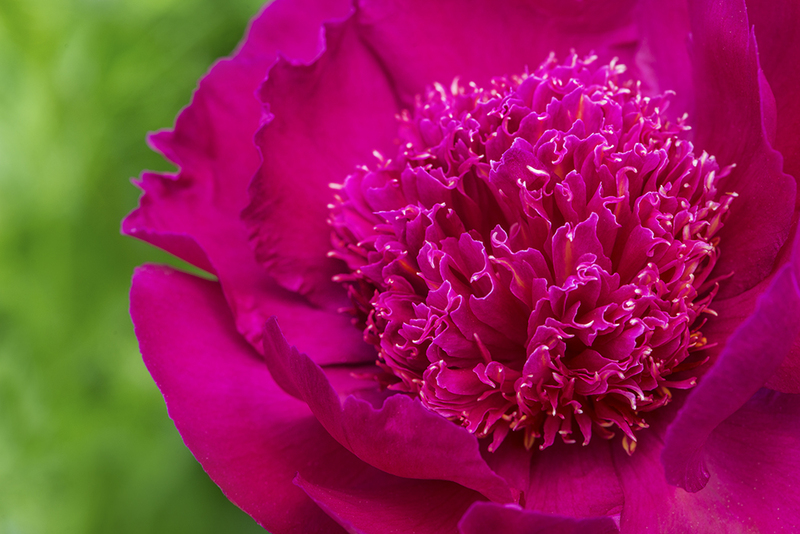 Here’s a little tip to achieve this bright punch of color in the background: I had my Nikon D800 with my Nikkor 105mm micro lens on a tripod and the peony framed and focused for my composition. I held my tri-grip translucent diffuser between the sun and the peony, but I let the background to the left be illuminated by the sun—that made the green pop against this hot pink peony. Sometimes I’ll diffuse the flower and the background but in this case, that background of lime green lit by the sun is just what I needed to make this image pop!